In an earlier article, we have mentioned about how you can send out tracked emails and get notified when recipients read them. But what if you’re on the receiving end of this situation and don’t quite like it? Email tracking services don’t usually notify email recipients that their activity is being tracked. And if you’re concerned with people tracking your email actions without your consent, you can protect your email privacy by knowing who is using an email tracker, and even block them from tracking you. In this article, we’ll explore a few solutions that block email tracking services from tracking email actions. Email trackers usually embed a tracking code within the email. When a tracked email is opened, the tracking code requests resources from the tracking servers, letting them know about the exact time, location and duration for which the email was accessed. But, you can prevent such tracking activities with the help of some third party browser extensions. Below are some of the apps that alert you of, and even block, any email tracker present in your Gmail inbox. Note: As of now, the solutions given below only work with Gmail (web). If you use an email client or a different email service provider, these solutions will not work for you. UglyEmail is a Chrome extension that scans your inbox and identifies which emails have trackers embedded in them. When you install the extension, you will see an “Evil Eye” icon in your Gmail inbox adjacent to emails that are being tracked, so you can easily identify them. 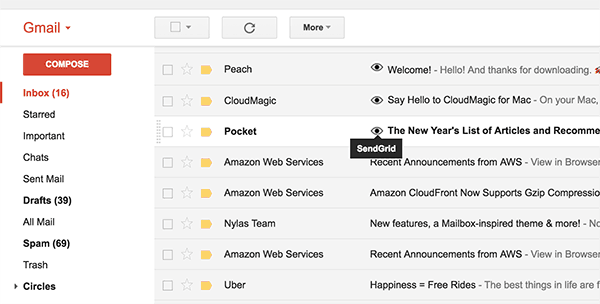 You can now decide whether you want to open them or just remove them from your inbox. The extension identifies tracked emails by looking for embedded tracking beacons within emails. Currently, it can identify emails being tracked using Streak, Yesware, Mandrill, MailChimp, Postmark, TinyLetter, Sidekick, MixMax, BananaTag and more. UglyEmail is a free extension for Chromium based web browsers, and is available for download in the Chrome Web Store. A Firefox extension is also in the works and may be released soon. UglyEmail is a great solution for identifying tracked emails, but it doesn’t stop them from tracking your actions. So, if you open a tracked email (which has been identified by UglyEmail), the sender will still know when and where you opened it. Sometimes, you may want to read an email without notifying the sender that you have opened it. 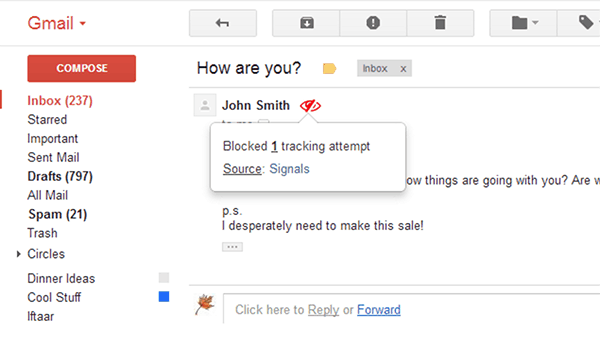 In such cases, another Chrome extension called PixelBlock, helps you block tracking pixels embedded within an email. With PixelBlock installed, when you open a tracked email from Gmail (web), you can see a red eye icon next to the sender’s name. This indicates that tracking pixels were identified in this email and have been blocked. So you may safely view the email, open links and attachments without worrying about being tracked. The email sender will receive no notifications of your actions on the particular email. PixelBlock is known to work with popular email tracking services, such as, Streak, BananaTag, Yesware, MailChimp, MailTrack.io, and more. PixelBlock is a free extension for Chromium based web browsers, and is available for download in the Chrome Web Store. If you know of any other services which can block email tracking services from tracking recipients’ actions, let us know in the comments below.